John and Stephanie Lowell have owned East Dennis Oyster Farm™ in the cool clear waters of Cape Cod Bay since 2003 when John applied for an aquaculture grant. 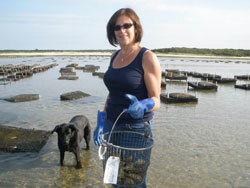 Today they each own an acre and are licensed to wholesale, retail and cater (raw bar) their product. East Dennis Oysters™ now compete with Wellfleet Oysters as the most sought after product on the market. The Lowell’s oyster farm is located on the tidal flats off Quivett Neck in East Dennis, MA. As many as 200,000 oysters, aka Crassostrea virginica or Eastern Oysters, are in various stages of development. 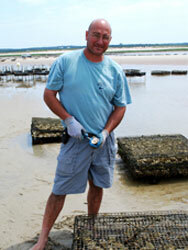 The Oyster “seeds” are purchased from an approved hatchery and are “planted” at the East Dennis farm. When the tide is out, the Lowell’s are at work tending their crop of oysters which are contained in hundreds of trays that are suspended on poles. The oysters stay above the sand, but are bathed by nutrient-rich crystal clear salt water when the tide is in. When ready for harvest the oysters may be bagged and delivered to local restaurants for which they have been specifically grown. Other oysters are sold wholesale to fish markets as far away as Texas, while others may be purchased on Cape Cod by calling the Lowell’s and picking them up. If you have a special occasion and want oysters served, you may choose the exact oysters you want from the trays they are growing in and they will be grown especially for you! Oysters that have not been harvested by late December are stored for the winter. The oysters are not growing at this time and any that remain after the winter will be returned to their salt water habitat in late March.